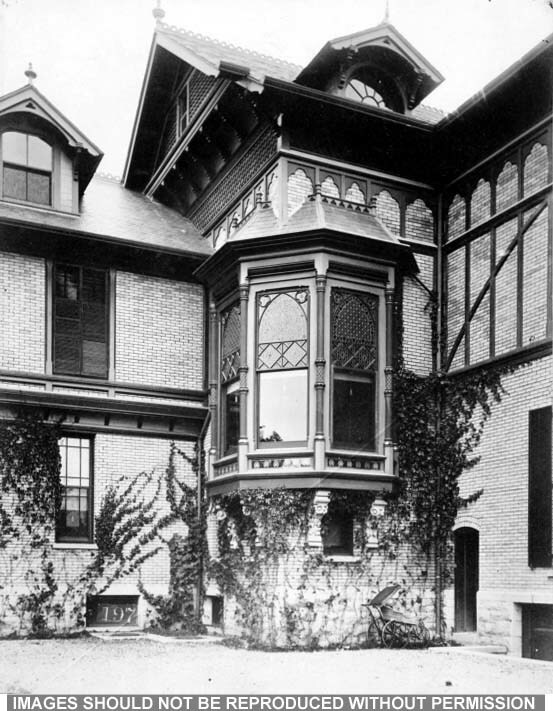 100 9/14 '197' obv: 'Blair Lodge Chicago'rev: 'Blair Lodge Detail / Chicago' Blair lodge [Larned house], Lake Forest (30 miles north of Chicago), overlooking Lake Michigan , by W L B Jenney, demolished c 1913. Built by the railroad baron John Insley Blair for his granddaughter Emma, daughter of Charles Scribner (publisher) and wife of W C Larned (art critic and novelist). Illustrated in the Architectural Reviewer, I (1897), p 7, reproduced in Turak, p 192. 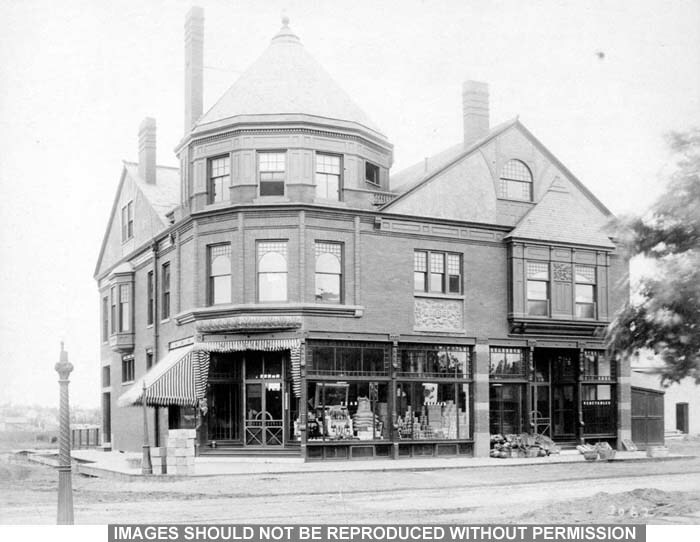 Ref Paddock & Miller, Lake Forest; Turak, William Le Baron Jenney, pp 189-90. Re-entrant angle of a two storey house of light brick with a pseudo-half-timbered upper floor, and a polygonal glazed bay in the angle. 101 10/14 '1607 Taylor' obv: 'Chicago'rev: 'Chicago' Chicago Front steps and basket arched piazza of a red brick Queen Anne building with a brick Ipswich window above. 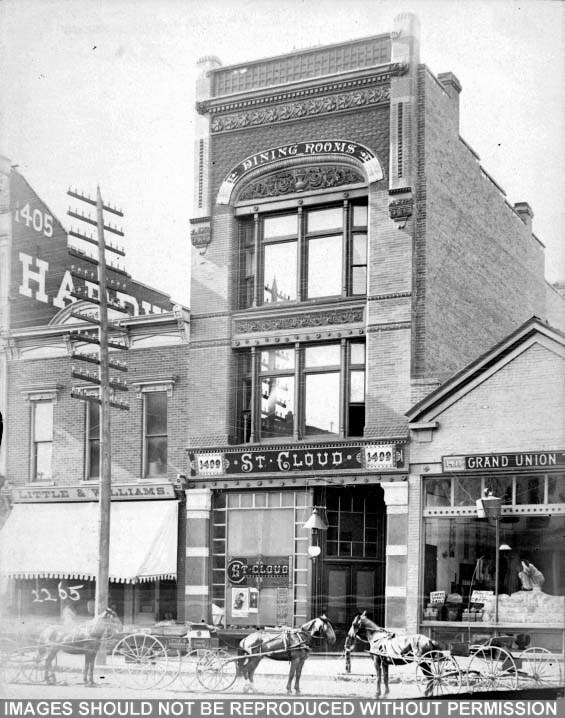 102 11/14 '2265' obv: 'Chicago'rev: 'Chicago / Adler + Sullivan' Chicago: St Cloud Dining Room, by Adler & Sullivan 3 storey building with 'Dining Room' on a basket arch at the top, and at the bottom a glazed shopfront with '1409 St. Cloud' 1409' above it and on the glass. 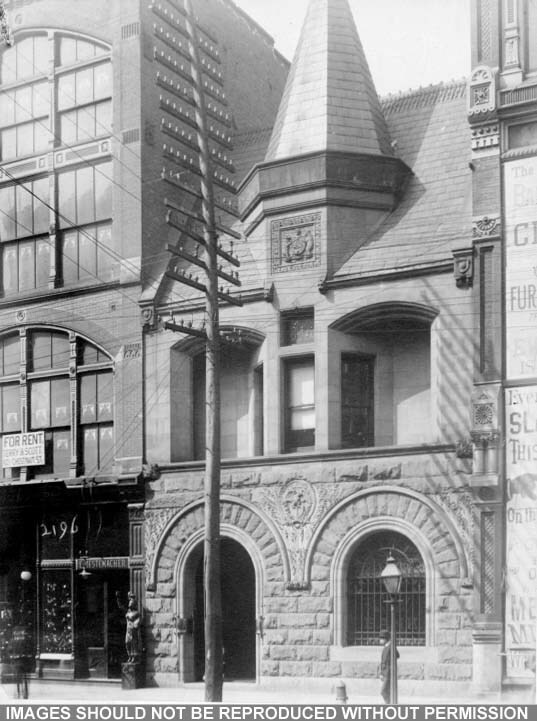 Building of Little & Williams to the left, and Grand Union at 1411 to the right. 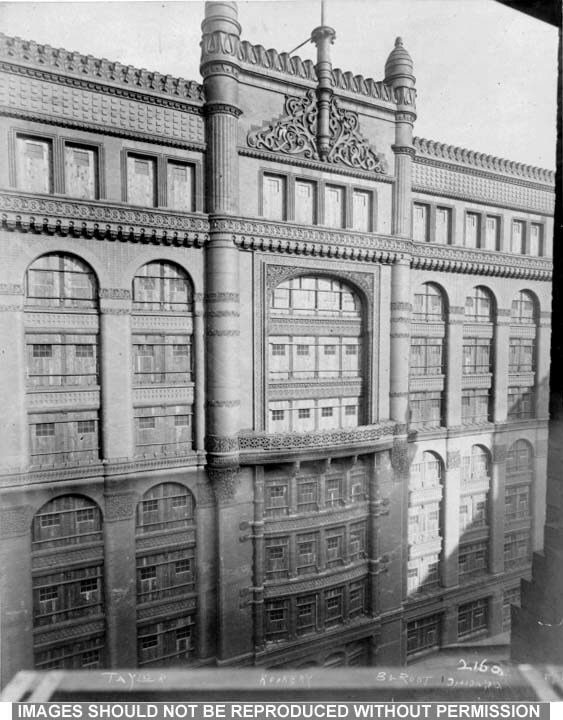 103 12/14 '2160 / Taylor Rookery B + Root JH.....' obv: 'Rookery Chicago'rev: 'Rookery Chig / Burnham + Root' Chicago: Rookery, by Burnham & Root Close view of the upper part of the façade. 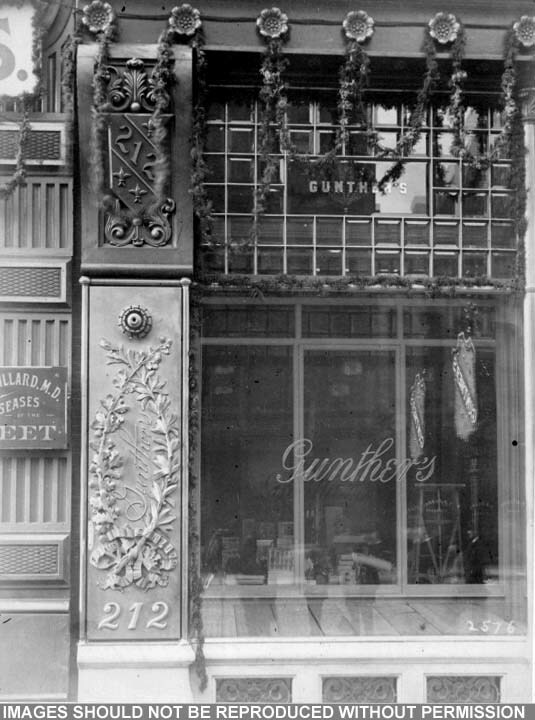 104 13/14 '2576' obv: 'Chicago'rev: 'Chicago / by Bates' Chicago: Gunther's, by [presumably] William A Bates Glazed shop window of 'Gunther's', no 212 (possibly artist's materials?). 105 14/14 '2196' obv: 'St Louis'rev: 'St Louis / by Peabody + Stearnes [sic]' St Louis: by Peabody & Stearns. 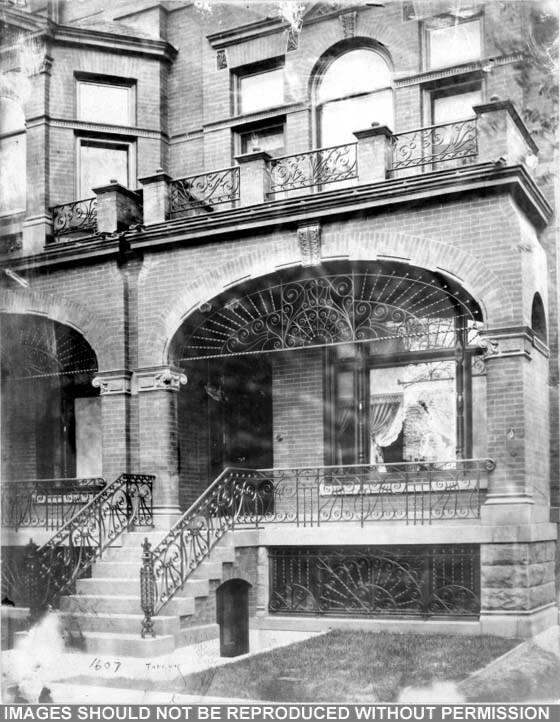 Could it be the St Louis Club Clubhouse, 1886-7 [ref Floyd & Holden] 2 storey building with rock-faced round arched ground floor, recessed balconies above, and central octagonal turret, also a medallion containing an eagle at ground floor level, and above a panel with two bears flanking a coat of arms. 106 15/14 '3062' obv: 'Chicago'rev: 'Chicago' Chicago: 1888 2 storey + attic pair of brick shops dated '1888', the corner one with a squat polygonal tower and conical roof, labelled 'teas' and 'coffees' on the windows; the second one labelled 'vegetables'. 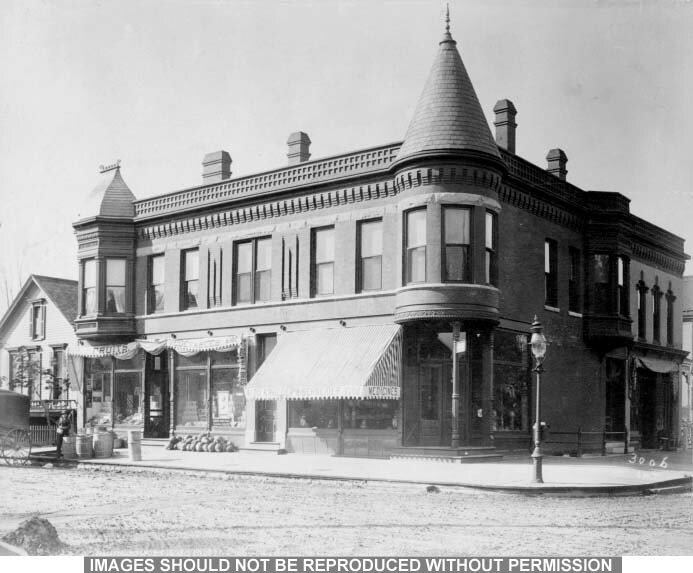 107 16/14 '3006' obv: 'Chicago'rev: 'Chicago' Chicago: 1888 2 storey brick building with one corner shop and another shop to each street; corner conical roofed turret, oriels to either street, brick façade with rock faced upper window lintels, semi-machiciolated cornice, canopy with '6100 Krueger & Schneider 6100 Medicines'.